ups: Uses DS stylus, good intentions, more brain games are always good. downs: Poor puzzles, issues with framing and story. Following Brain Age\'s popular and critical success, other brain training games were certain to follow. Like many great games, that means that Brain Age will spawn both great and awful games. While they aren\'t awful, Brain Boost: Beta Wave and Brain Boost: Gamma Wave definitely aren\'t great. According to the game boxes, Brain Boost: Beta Wave helps players to boost brain power by improving concentration, and Brain Boost: Gamma Wave boosts memory. Both rely on Makoto Shichida\'s \"right brain development theory.\" The theory underlying both of the games is interesting, and the idea of using mainstream games for educational purposes is positive and useful. 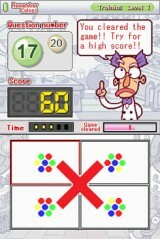 The Brain Boost games have simple formulas, cute graphics, and when played on the DS they have a solid interface. Despite all of these factors, the Brain Boost: Beta Wave and Gamma Wave games don\'t manage to be fun because their puzzles aren\'t fun. If the Brain Boost games had been released prior to Brain Age they may have fared better for lack of an example of the concept done well. Even if they had been released prior to Brain Age, though, and so didn\'t have to stand the comparison, they still wouldn\'t have been good games. They each have an odd introduction that ultimately leads to dull puzzles, which means the heart of the Brain Boosts is sort of boring. Brain games are analogous to puzzle games and puzzle games don\'t have to be exciting. Unlike many game genres, puzzle games don\'t need to be action-packed and don\'t need 3D graphics or high polygon counts. Puzzle games need to be fun the first time and for the many times that players repeat the game, because they rely on their solid foundation and then on repeatability. For example, Tetris isn\'t exciting in the normal sense. However for those who enjoy puzzle games, Tetris is fun and satisfying the first time it\'s played and each time thereafter. Like Minesweeper and Solitaire, Tetris lacks many of the components that most other games require. Instead of emphasizing other aspects like graphics and sound, Tetris and other successful puzzle games rely on their simple, repeatable formula for gameplay. Find a Match: This is like the card game Memory. Players must find and click on the matching pair of images. Shape Recognition: One grid is displayed on the left and then players must find the matching grid from four displayed on the right. Addition: Cards with numbers are shown and players must add up the numbers and click the correct answer from the four answers at the bottom of the screen. Remember Sequence: Cards are flipped over one-by-one in a screen like \"Find a Match.\" Then, players are asked which card was flipped over first, second, third, fourth, and so on. Moving Dots: Dots move across the screen and players must figure out how many dots are on screen and choose the answer from the four options displayed at the bottom of the screen. 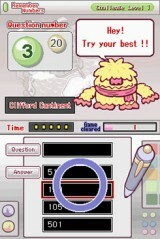 The training and challenge modes each have four levels of difficulty. Players earn points by choosing the correct answers and by completing the puzzles with time to spare in each of the modes and each of the levels. Many of these modes and their puzzles are hindered by a lack of variety - the challenges are the same as the training. At the same time, Brain Boost: Beta Wave also doesn\'t keep track of player training, so progress charts - which can be fun on their own - aren\'t available. The puzzles are repetitive, but without being fast, cute, or fun enough to be good games for the first time through, let alone the times that follow. At times the games were even annoying, something a puzzle game should never be to a puzzle game fan. Remember Colors: Here, a pattern made by colored dots appears and then disappears. The pattern is replaced by four patterns from which players must choose the correct pattern. Remember Numbers: A number appears at the top of the screen and then disappears. Four numbers appear below and players must choose the initial number from the four numbers displayed. Remember Circumstances: A set of images appear and disappear. New images are displayed, and then players must choose the image that was not initially displayed. Remember Faces: A face appears and then disappears. Four new faces appear, and players must choose the image that matches the first image from the new faces. Remember Images: A set of images are displayed on the left side of the screen. Then, the images are displayed on the right and players must choose which image was not in the initial set displayed on the left. The puzzles again are fairly similar both to each other and to the games in Brain Boost: Beta Wave. The puzzle problems could be mitigated by other aspects of the games, but even the games\' frames have problems. Brain Boost: Beta Wave frames the game within a plot about a robot that has lost his memory. There are a number of cut-scenes that have nothing to do with the game itself. This simply doesn\'t make sense and it actually makes getting to the puzzles more tedious. The framework could be ignored since the scenes can be skipped, but that leads back into the puzzles themselves. While neither of the Brain Boost games succeed, brain development games can be excellent, as Brain Age has shown. Makoto Shichida\'s \"right brain development theory\" is also promising. In it, Makoto Shichida argues that the right brain continues to develop throughout life and that most of the dormant abilities lie in the right brain. Brain Games and games for training and self-improvement are a great idea in what is still a relatively small genre for gaming. Hopefully, later iterations of the Brain Boost games will more fully and enjoyably represent Makoto Shichida\'s theories of brain development. In the meantime, players looking for fun brain games should stick with Brain Age, Big Brain Academy, or one of the free online brain games.